Each year I update my editable calendars and birthdays product on Teachers Pay Teachers. Currently, it is for 2018- August 2020. So, if you already own this product, you may re-download for free. Many of the files are editable, but of course, they do not have to be edited for use. Editing means the pages may be personalized for the class, as teachers can add the names of students to the pages if wanted. Scroll to the bottom of this post for a birthday freebie link, too. Please see the preview file at this link for more information. 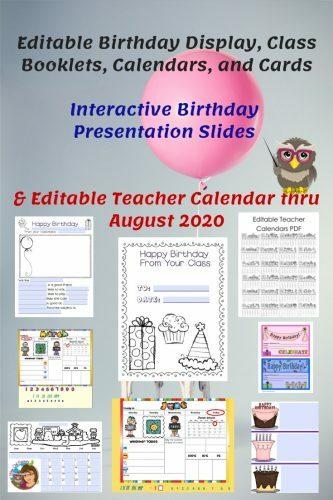 SMART Board file, 30 slides, for highlighting birthdays and star of the week students Put your student’s name up in lights by personalizing these slides with different themes. The editable PDFs may be edited or not (student names added, for instance). If the blue squares are not typed in then nothing from that space will appear on the printout. The calendars may be printed without editing and students could write on the paper. If a class calendar is printed out without editing, students might color code the different weekly events such as coloring library days yellow, and gym days blue. The calendars could be sent home to parents. 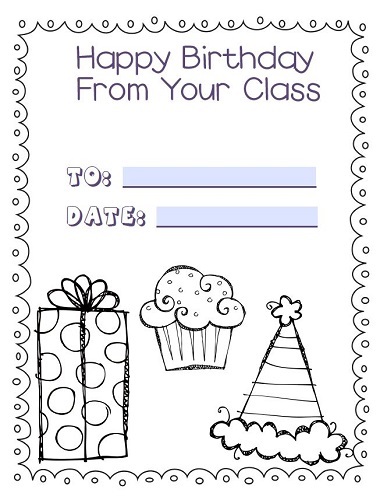 The birthday month letter-sized poster have space for teachers to type in student names. For sure, though, the editable birthday awards would be good to personalize. 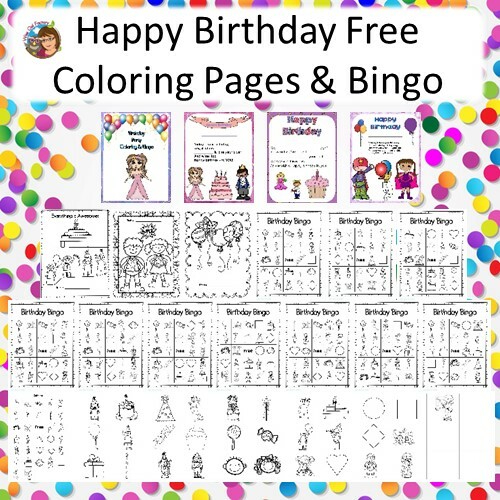 There are covers, drawing pages, and writing pages for the students to make a booklet to give to the birthday child on his or her birthday. The teacher edition allows for editing (typing in text if wanted). A class booklet could be made with the printable covers and student writing pages for either the Star of the Week or Birthday person. 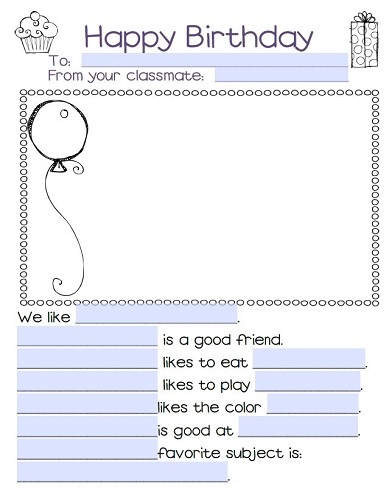 Each child in the class can write a page using the writing frames. Assemble the booklet to send home as a class remembrance, and print the slide for an “award” to be sent home. This would help meet the following standards as these are shared writing projects. The covers may be edited, also. There are different covers from which to choose. Kindergarten, Number, and Operations in Base 10, Work with numbers 11-19 to gain foundations for place value. The birthday product also includes the editable calendar product. 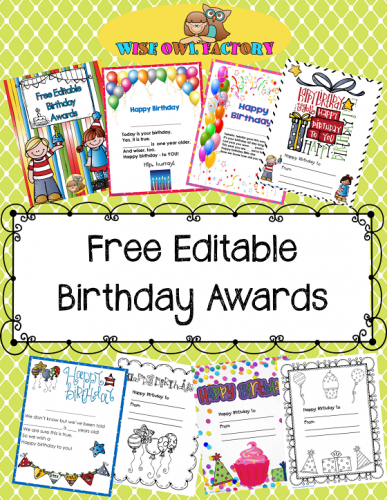 You might also like this freebie, editable birthday awards on Teachers Pay Teachers.